Recently, I re-watched the movie, “The Stone of Destiny” (2008). It’s based upon the true story of Ian Hamilton and a few of his friends who, in 1950, stole the Stone of Destiny from Westminster Abbey and drove it back to Scotland. Not an easy feat considering that the stone weighs over 300 pounds and is 26” by 16.75” by 10.5”. You might be thinking it was an act of vandalism, but it wasn’t. It was a statement of Scottish national pride. The Stone of Destiny, also known as the Stone of Scone (Stane o Scone in Scots; “Clach-na-cinneamhain” “stone of descent” in Gàidhlig), has a long history that begins with the first crowned King of the Scots, Fergus, son of Erc, (Fergus Mòr Mac Earca, “Fergus the Great, Son of Erc”) who sat upon it for his coronation early in the 6th century. Historical accounts from the 15th century show that Fergus brought the stone from Ireland to Argyll, the domain (in Scotland) of the Irish Dál Riata Gaels . It is believed that the Stone was originally part of the Lia Fáil (“Stone of Ireland”) in Ireland, which was the coronation stone for the kings of Tara. There is a legend that tells of the stone being Jacob’s Pillow, and that it came to Ireland from Syria via Egypt and Spain by a descendant of King Gathelus. And then, the stone was brought by the invading Scots to Argyll at Dunstaffnage Castle and to Aryshire. The more ancient descriptions of the Stone do not match what it looks like today. There are a few written accounts of the stone and they tend to agree that the Stone is black or grey with a metallic sheen that may be because it is a meteorite. It was also described to have engravings where precious metals had been melted in as fill. The description of someone who was witness to the coronation of King Alexander II described the engravings as “writ in an angelic tongue” and a footprint was on the top of the stone. Today, it is described as “red sandstone” and geological tests have put the source of the Stone at a quarry near the Abbey of Scone where it had been placed by Kenneth I MacAlpin in 843. Why the difference? It may be explained by the stories of how, King Edward I of England (“Hammer of the Scots”) wanted to take the Stone back to England with him after subduing the Scots in 1296. He had already taken the “Black Rood” ~ Scotland’s holiest relic ~ a piece of the True Cross that had belonged to Saint Margaret, wife of Malcolm III of Scotland (Maol Chaluim mac Dhonnchaidh) in the 11th century. The Stone was the symbol of Scottish sovereignty and independence. Edward I probably wanted to not only have the Stone to prevent any future Scottish Kings from being crowned upon it, but he wanted to show that any English King crowned upon it was also a ruler of Scotland. As Edward I approached the Abbey, the Abbott hid the true Stone and replaced it with another. Some reports say he gave Edward I a sewer drain cover. Edward’s intention was to take the Stone back to London, but he only took it as far as Edinburgh and left it there. Perhaps he became aware that the sandstone was not the same as what the records described. Two years later, Edward I returned to Scotland and ransacked the Abbey, ostensibly looking for the real Stone. He took the Abbott back to London and tortured him to find the location of the real Stone. There was never a replacement of the Stone, so one hopes that the Abbott kept his secret. 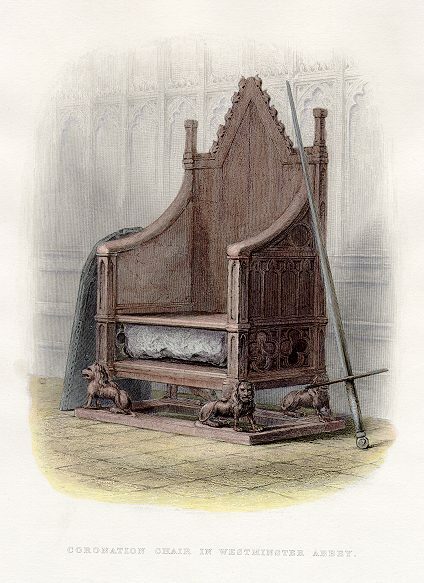 When Edward I died, his son, Edward II had the Stone removed from Edinburgh and brought to London where he had a Coronation Chair built to hold it in 1301 and it was first used at his own coronation. It has been used at every coronation since. As part of the Treaty of Northhampton in 1328, the English offered to return the Stone to Robert the Bruce. 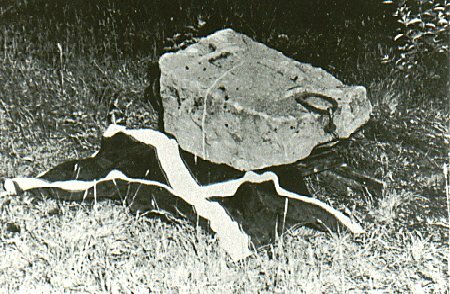 Some accounts say that it was the rioting crowds in London that prevented the Stone from being removed and taken back to Scotland. Others say that the offer was refused by Robert the Bruce. Perhaps it was because he knew that it wasn’t the real Stone of Destiny, and perhaps he was crowned as King of Scotland on the real one. It is not so far-fetched to think that what is seen as the Stone is not the real one, since geologically it is similar to the sandstone found at Scone, and not the stone of Ireland or Syria. The Stone remained in London for six hundred years. When James VI of Scotland also became James I of England, and the Stuart dynasty began, his coronation took place in London while he was sitting in the Coronation Chair over the Stone. The last Monarch to be crowned upon the Stone was Elizabeth II in 1952. In July of 1996, it was announced in the House of Commons that the Stone would be returned to Scotland, and on November 15, 1996, it was ceremonially handed over at the Scottish border. From there, it was taken to Edinburgh Castle and arrived fifteen days later on St Andrew’s Day. It can be seen on display along with the Honours of Scotland. Scotland’s crown jewels, known as the Honours of Scotland, are the oldest regalia in the British Isles. They are composed of a jewel encrusted crown, an elaborate sword and a sceptre, all of which date from the 15th and 16th centuries. They were first used together to crown the infant Mary Queen of Scots at Stirling Castle in 1543, and were then used at the coronations of James VI in 1567, Charles I in 1633 and, the last sovereign to receive the Honours, Charles II in 1651. The first time I saw the Stone and the Honours, it took 45 minutes to go through the queue as it wound up the stairs to the tower. The second time, Kyle, Liisa and I got there at 12:50 PM…ten minutes before the cannon are fired from the battlements, and everyone was waiting in the courtyard. We had a clear path up to the tower. Both times, I was filled with awe. The Honours were hastily hidden in the mid 17th century to avoid being destroyed as the English crown jewels had been by Oliver Cromwell. First they were taken to Dunnottar Castle in Aberdeenshire. They were smuggled out during a siege and buried a few miles away in Kinneff parish church for the next nine years until the monarchy was restored 1660. Following the Restoration, they were used at sittings of the Scottish Parliament to represent the Scottish-English monarch (who resided in London after 1603 following the Union of the Crowns). After the Treaty of Union in 1707 removed Scotland’s independent parliament, the Honours of Scotland were considered redundant and were locked away in a chest in Edinburgh Castle. They were literally forgotten about for the next hundred-plus years until Sir Walter Scott searched for them in 1818. They were hidden again in fear of a Nazi invasion during World War II. All of this history was part of the movement that led to the taking of the Stone in 1950. In post-war Scotland, there was a Nationalist movement to make Scotland independent from England. An off-shoot of the Scottish National Party was the Scottish Covenant Association, led by John MacCormick in the 1940-50’s. The Covenant Association was in favor of devolution (regional power) as opposed to the full-out independence that the National Party wanted. The taking of the Stone was a political statement. When Ian Hamilton and his friends (one of whom was actually a direct descendent of Edward I) took the Stone, it broke in to two pieces. They took each piece in a separate car and got the Stone back to Glasgow where it was repaired by a stone mason. Four months later, they left the Stone, draped in the Saltire, at Arbroath Abbey, where the Declaration of Arbroath had been made in 1320. (A letter written to Pope John XXII, the Declaration intended to confirm Scotland’s independence as a sovereign state and was signed by thirty-nine ranking Scottish landowners.) They left the stone there, hoping that the Church of Scotland would keep it safe, but it was returned to Westminster Abbey in April of 1951. Ian Hamilton later became a lawyer, and when sitting for admission to the bar, he refused to swear allegiance to Queen Elizabeth II. He objected to the Monarch using the number II after her name, because Queen Elizabeth I reigned before Scotland was part of Great Britain. Thus, for Scotland, the present Queen would be Elizabeth I. He brought a lawsuit to defend his right to refuse, and lost. In 1997, Scotland held a referendum for devolution and the Scottish Parliament convened in May of 1999 under the Scotland Act of 1998. The Stone will be taken to Westminster Abbey from Edinburgh Castle only temporarily when the next Monarch is crowned, and then it will be returned to its resting place alongside the Honours of Scotland. This entry was posted in Ancestry, Eco-travel, Scotland, Scottish ancestry, Self drive Scotland tours, Travel, Uncategorized, Women Writers and tagged Coronation, Scottish devolution, Scottish Nationalism, Stone of Destiny, Stone of Scone. Bookmark the permalink. Yes, even though the movie took a bit of liberty in how it was protrayed, it is certainly a striking scene. (Cue the tears) I hear both sides on the question of Home Rule from friends in Scotland. It will be very interesting to see how it turns out. Regardless of their motives or passion the act was an act of vandalism. They were selfish and had no respect for the stone and what it means to many. They BROKE it! There may have been some sort of good intentions but very poorly done and not to be respected. I have no opinion of where the stone should be or of the struggles of Scotland and England I just think it was a selfish and destructive act. You are correct, it was vandalism. And so was dumping a few ship loads of tea into Boston Harbor.